Hand hygiene is essential for good health, yet many people do not give it much thought – even forgetting to do it at times, especially when at work. Maybe it is the lack of amenities that makes one forget… or perhaps just the general busyness of the place… or maybe because there is no Mum to scold you into remembering. Think of all the things you touch with your hands throughout the day – money, door jambs, handrails, counters, and the list goes on and on. All these objects that your hands come into contact with are breeding grounds of countless bacteria (including e. Coli and salmonella, just to name a few) that can make you and your co-workers very ill. Hand washing is an effective way to prevent transmitting germs from one person or object to another person or object, significantly lowering the risk of spreading diseases. You don’t want an office full of sick people sniffling and hacking through the day, struggling to finish their work. Regular hand washing can prevent the spread of common diseases (see reason number 1) such as the flu and the common cold on chilly months, and thwart the development of rarer types of diseases that we shudder to think about. The need for a hand sanitiser at work is especially important if your business is in the food industry where good hygiene amongst the staff and cleanliness of the workplace is paramount. What you really want to do in your workplace is to establish the habit of hand washing among your staff. But how can they start developing this habit if there aren’t any liquid soaps or hand sanitisers in the washroom? 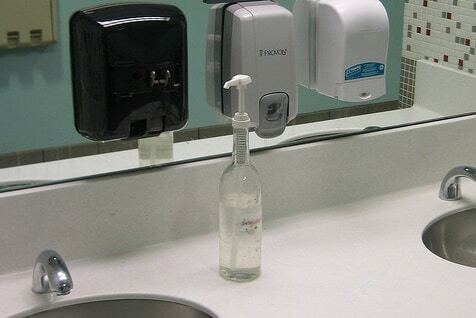 The sight of a full bottle of liquid soap by the sink will remind everyone of what they are supposed to do (and it helps if the soap smells amazing too!). Healthy people make more and that’s a fact. The simple act of habitual hand washing can help keep your team or staff in tip-top shape and performing their best. And with fewer diseases (or none!) going around, you can expect exceptional attendance even during flu season. A well-equipped washroom is one of the best benefits you can give your hardworking team. It may seem like a small thing, but knowing that they have a place to relieve themselves and clean up afterwards before going back to work will make them cared for and valued. As an added benefit, a washroom that includes all the works – hand soaps or hand sanitisers, paper towels, hand dryers, and seat sanitisers – also looks good to guests and definitely helps present your workplace in a positive light. Whatever your business may be or what industry you are in, there is a perfect washroom solution for you. Alsco offers different hand sanitisers suited to specific needs. Moreover, they offer other hygiene products which you can review in better detail when you visit their website. Not sure which one is the best for you? You can seek advice from their friendly sales representatives for free when you call 1300 733 177.